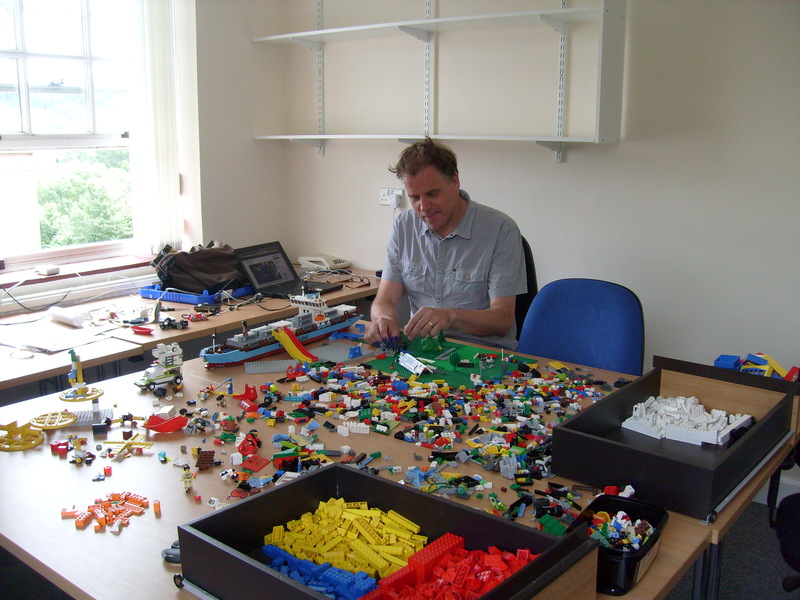 Following the publication of my recent paper on ludic geographies in Geography Compass, I was invited to play at the ‘Lego Lab’ in Exeter. This creative space is home to Geography’s Follow the Things (FFT) team, conceived and led by Dr Ian Cook. The FTT project draws together filmmakers, artists, activists and students to explore the stories behind – or ‘social lives’ – of the things we buy (groceries, fashion, electrical goods, pharmaceuticals, gifts and more) using a variety of creative and playful means to communicate these hidden relations to wider publics. 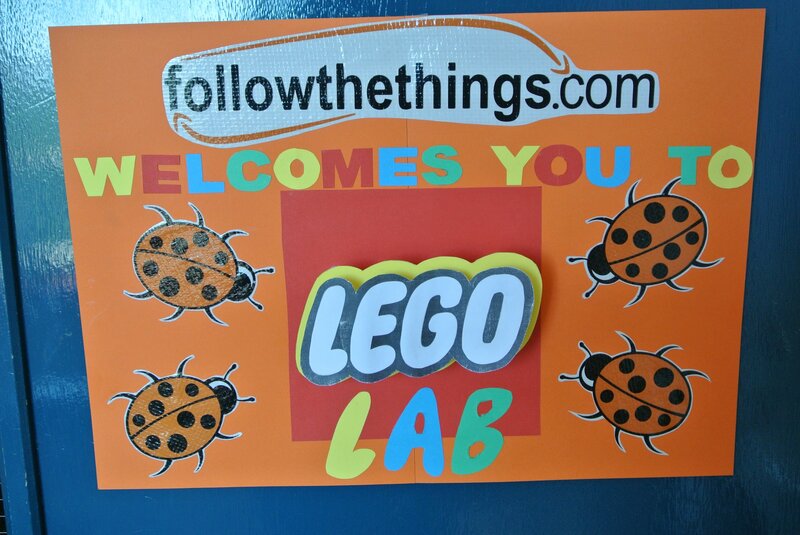 The lynchpin of the project is the Follow the Things website, although others may also be familiar with the FTT shopping bags and ladybird activities. During my time at Exeter, I sat in on Ian’s Level 3 course, Geographies of Material Culture, a truly innovative and inspirational module. Given my interest in play and materiality, Ian was generous enough to offer me the chance of co-authoring a book chapter with him that playfully used the format of an auction catalogue to argue that affirmative modes of critique that are themselves vitally material might be better placed to engage consumers than more morally charged didactic forms of activism. (This chapter can be found in the Wiley-Blackwell Companion to Economic Geography, 2012.) As part of the writing process, we watched, read and played with a number of examples of follow-the-thing type work, cutting out and sticking things onto large sheets of paper and annotating them with (our now trademark) felt-tip pens. One example in particular – The Luckiest Nut in the World – stuck in my mind. Imagine pistachios and cashews singing this ditty. 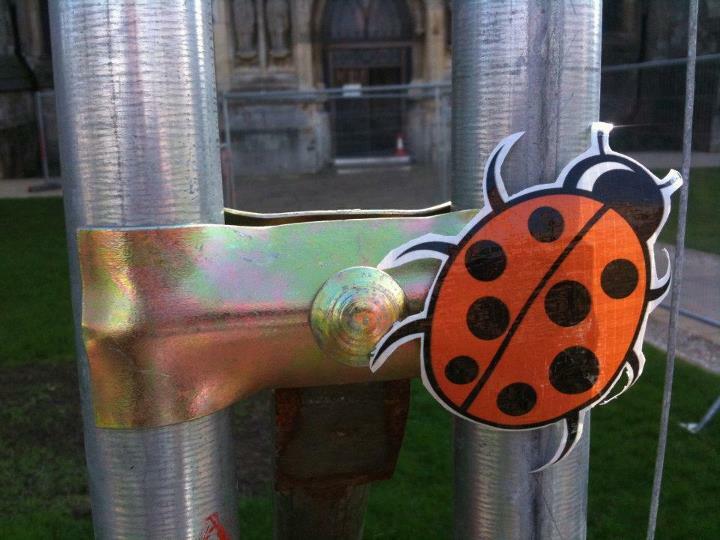 The relevance of this will become clearer… Last year Ian’s class got involved with the Occupy Exeter movement, shifting the classroom to the camp on Cathedral Green. This prompted me to visit the London site, resulting in my fascination with the radical roots of Monopoly, the subject of an earlier blog post. So, on a warm summer’s day I arrived back in Exeter to meet Ian in the foyer of the magnificent old Hatherly Building. From here I’m led through the dingy basement, up a narrow staircase to the recently decorated, bright and airy rooms of the FTT HQ. Here I’m greeted with a mass of Lego pieces – in various colours and shapes – sprawled across a table, with some semblance of order to the edges where someone had clearly taken the time to separate some pieces into constituent colours. More than anything I’m overwhelmed, where to start? Ian: I play Lego with my daughters and we really enjoy making mad things together. When we had our shopping bags made and I started tracking the ship [they were being transported on], we had a Lego catalogue delivered at home that had a Maersk container ship in it, which I thought was amazing. I checked it out online and found this great review by a Lego fan and merchant sailor. He talked about its accuracy in relation to a real container ship and then talked about ‘your Lego’ getting to you on a ‘ship like this’. I tweeted about the real ship carrying the bag and the container ship, too, last summer and this year had the money to spend on it. Finally, two more things that coincided with the Occupy activities at the end of last year: a) the Occupy Legoland re-creations of iconic Occupy protest (plus the bizarre toy protests in Russia) [see my earlier post]; and b) coming across David Gauntlett’s book Making is connecting, and reading about his work with Lego (plus, of course, thinking through the things I learned from [Tara], trying to put great ideas into some kind of practice). There was something wonderful about creativity that has developed over the course of this 2012 intern/summer school, and I was particularly struck by the performance activism work that we did with Tony Perucci a few weeks ago, in which he encouraged us to act quickly and not plan too far ahead, bypassing our frontal lobes. Playing with Lego also does this – fiddling, making, talking and not having too much of an ‘end result’ in mind at the start (Diana started with a Lego wand this morning), the process generating the ideas, which then… even though there were a few ideas at the start to do with re-creating famous container ship wrecks (I can’t let go of that! ), the potential and our experience of working creatively in this way led to the purchase of the ship. This is what should have happened, somehow. We all played Lego (or Duplo) as kids…. It’s not even an interest in Lego, it’s a LOVE of Lego!! 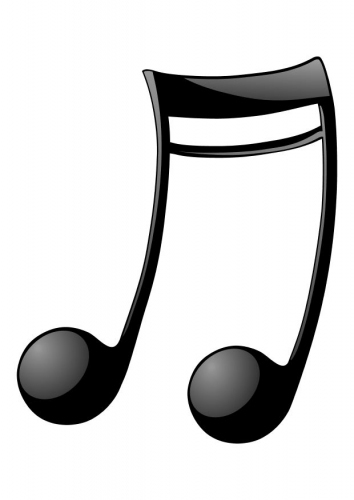 And what it can help us do and think… Whoop. Diana: It began with the Maersk container ship. A container ship, in and of itself, is incredibly relevant to followthethings.com, both for the nature and the amount of cargo it transports. Though we spent time talking about the container ship, including finding out interesting facts about Maersk (posted on our Tumblr site), we quickly got caught up in the fun and detail that building the ship required. It became such a useful teambuilding and collaborative exercise that I think we were all quite sad when we finished building the ship in a few hours. That disappointment quickly turned into a collective sentiment to keep going with Lego and see where it would take us. On a personal note, I’ve played with Legos since I was four years old, and I have nothing but fond memories. To be able to play with them ‘academically’ or for academic purposes was an amazing lesson for me on how to borrow from children. Lego is endlessly inspiring—one block can turn into a building, a plane, a horse, a tree trunk –and that blank slate kept the Lego Lab upbeat and refreshing. Everyone wanted to see what everyone else was building and was always willing to help out their mate. Combining teambuilding with purposeful creativity yielded spectacular results and I would recommend that every office environment try this at their next meeting. Whilst not having an ‘end result’ in mind appeared important to the team, I found the vast array of plastic pieces in front of me overwhelming (possibly something a scholar of the ludic shouldn’t admit!) Bewildered, I started by searching out pieces other people were looking for in the collaborative way Diana talks about. Sabrina: Lego has long held a special place in my heart… my parents gave my younger sister and I each a tub of Lego one year for Christmas when I was about seven or eight. We used to play Lego for hours, building houses and acting out different stories with our mini figures. When I was fifteen I made two stop-motion videos using my Star Wars Lego mini figures, one of which was a re-telling of Book 12 of Homer’s Odyssey. I realised then the potential of Lego for creative story-telling and engaging audiences and was thus very excited to bring Lego into the FTT experience as well. Lego seems to have an almost universal appeal and even if people don’t play with Lego themselves, they do seem to enjoy looking at pictures of other people’s Lego creations. 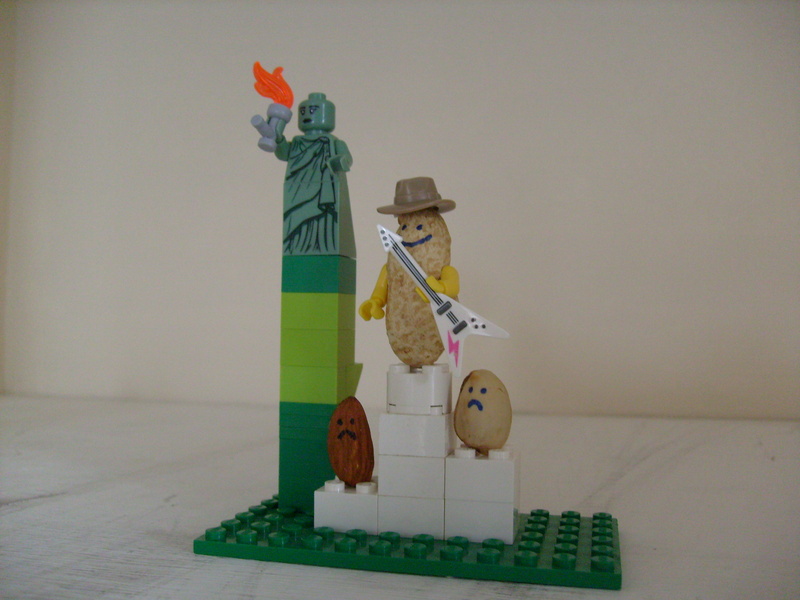 I hoped that Lego would help us to be more creative with our work and would draw people to the FTT website. Ellie: I have never had the opportunity to play with Lego before, until now. I was a Duplo kid! I always remember being at my friend’s house as a child and him and his brother having a massive box of the small multi-coloured bricks, but I was more of a toy horse kind of girl, and never played with them, I just rooted out the plastic animals. I am a creative/artistic person anyway, so I guess what I was most interested in was the idea that we were going to get creative, innovative and co-creative over the coming weeks. I didn’t feel I shared the connection with Lego that everyone else seemed to have from childhood nor would I be able to relocate that childhood enthusiasm through reminiscing. So when faced with my first ever pile of Lego bricks, in all honesty, I was a little nervous. They are really small! It’s not like Duplo where with 8 bricks you can have a viable home for your plastic animal! Lego seemed to require some sort of inbuilt skill! But I copied what everyone else seemed to be doing and got tactile. I get it now. There is definitely a sense of achievement when you finish a small scene and it actually looks good. Especially photographed, there is something visually captivating about Lego. As a tool, it allows for new ways of expression, creativity, silliness and as Ian has mentioned you don’t need to go in with a plan. In fact the outcomes seem better when nothing’s planned! So for me, my interest in Lego has developed since the container ship arrived, it’s a new interest. It seems to fit in well with our ethos, and I see it as a metaphor for so much of the stuff we do. Connectivity, co-creation, co-learning, accessibility, relationality, tactile geographies, a playful way of saying something serious, iconic, symbolic. As a material object there is also A LOT to be said about it. I had a small amount of Lego as a child, but I can only remember building a house with it, probably a similar house over and over again. I don’t remember having Duplo, but I definitely had Sticklebricks – do they still exist? During this particular session, team members started to recreate stories they had researched previously in plastic form, for example organ-trafficking as told by Nancy Scheper-Hughes (2004, Ethnography, 5/1). This inspired me to create scenes of/from the examples I had worked with previously in the writing project with Ian. The obvious starting point was the Luckiest Nut… Fired up with a new enthusiasm, I decided to bend the rules a little – we were there to play after all – and sourced a variety of nuts from the campus shop. I then used these as the basis for my Lego creation, combining this with a topical Olympic theme. The interns were bemused and puzzled, they weren’t aware of this particular example. Prompted by my (somewhat dramatised) shock Ian played the Luckiest Nut video while we played (worked?). With my confidence building, I started fiddling with pieces that caught my eye – some wing- and missile-shaped pieces, wheels and brightly coloured ‘lantern’ shapes. I had some kind of aircraft vaguely in mind, but the creation took on its own shape depending on which pieces worked best together and the serendipity of pulling pieces from the sprawl in front of me. I quizzed the team on what they hoped to achieve with their Lego based activities. Working in a non-hierarchical, engaging, tactile way; being able to express and enact ambivalence around the darker side of commodity production; and communicating with others (including those beyond the academy) in a non-didactic way seemed to be key. Ian: After working with Tony, one of the things that came across was that the process was the thing that would help you to ‘achieve’, and that you wouldn’t necessarily have a strong idea of what that achievement might be, except that we would create something together, in a relatively non-hierarchical way, that we would enjoy (and laugh a lot about), and that we could somehow share with others … I wanted us to achieve something new and engaging in a FTT way, to which we could all contribute… It’s part of that argument about creativity enabling a positive form of critique of commodity fetishism. A lot of the Lego scenes and photos made have an amazing quality, for me at least, of being shockingly … I don’t know what the word is … hilariously uncomfortable, powerful, awful, in a good way, tasteless, carefully shocking, dark, spooky… the Lego slaughterhouse, the McLibel 2… It’s turned out not only to be about communicating what the site and our work has been about, but a way of appreciating the issues more deeply, perhaps, … I am possibly getting carried away here. I was hoping that this would happen… hahahaha. Ellie: …A playful way of saying something serious and a form of co-learning through being creative. Where everyone is on a level playing field. Where every brick holds some sort of capacity of creation in the eyes and imagination of its beholder. Where hands are the fleshy medium of the imagination giving magical qualities to the very material bricks by lending form to them. When I was a child I had a massive imagination, I’ve always feel nostalgic for the days where I could just spend my time being a fairy or a horse (I’m pretty sure 50% of my childhood was enacted as a horse) but I think what this has shown me is that this imaginative quality we associate with being a child is in fact still in us as adults. 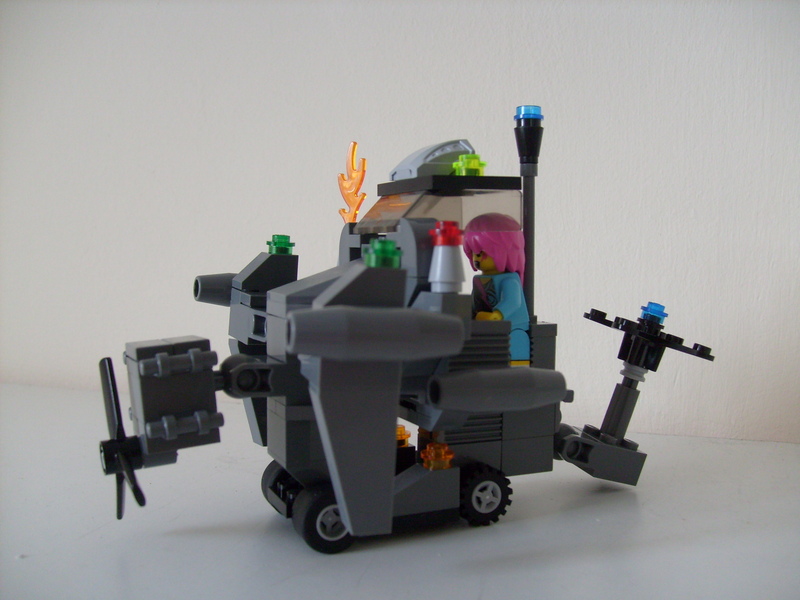 Objects such as Lego are one way of re-accessing it, or awakening it. I think if we can tap back into our imagination and the capabilities it offers us then we can find new ways of learning and thinking about things! Sabrina: I didn’t have a specific goal in mind other than to be creative, have fun, and begin to think about ways in which academics can engage audiences through forms other than writing. It was great to get away from the computer screen and books and to just start producing things without a lot of premeditation. Reproducing scenes from our compilations turned out to be a great idea, especially when we moved into the realm of the unnerving or even downright gory. There is something almost wrong, but deliciously fun, about taking innocent little children’s toys and using them to depict the more violent and unsavoury aspects of human action and experience. Even if the scenes we created don’t necessarily prompt critical thought, I hope they can be provocative–or even just ‘cute’–enough to get people interested or curious about FTT’s work. Diana: Because we got so much pleasure out of using the Lego for our work, I hope that other people can sense our creative excitement. Since followthethings.com usually addresses the darker aspects of our modern economy, the Lego offers an unexpected, quaint, nostalgic and jarring juxtaposition to the subject matter at hand. Furthermore, the site is geared toward young geography students, and we hope that the Lego figures will illustrate the dynamic and innovative elements of our work. It’s not just dry academics. Instead, we offer a way for you to think about the economy using tools already available to you. So what did I create? It gradually became a symbolic piece I retrospectively labelled ‘Capitalism’. I look forward to seeing how this work, sorry, play(!) develops. Thanks to Ian Cook, Ellie Bird, Diana Shifrina, Sabrina Skau and Eeva Kemppainen.